Renewal Offer Expires in 72 Hours! unprecedented low price of only $149 $69 a quarter. 12 full issues of Global Property Advisor—1 per month. Each issue is packed with real-world insider information from people who are actually doing what they teach. Access to Overseas Property Alert. This email newsletter is delivered weekly and lets us keep your finger on the pulse of exactly what is happening in the world of global property investing. Shipping & Handling - Global Property Advisor is an electronic dispatch, delivered straight to your email inbox each month. There is no shipping and handling fee. I understand that you might be skeptical that my advice in Global Property Advisor will truly give you the tools you need to invest in great property deals around the globe. But while you might be skeptical, I am absolutely confident that Global Property Advisor will do just that—and more. Test drive Global Property Advisor for a full 90 days. 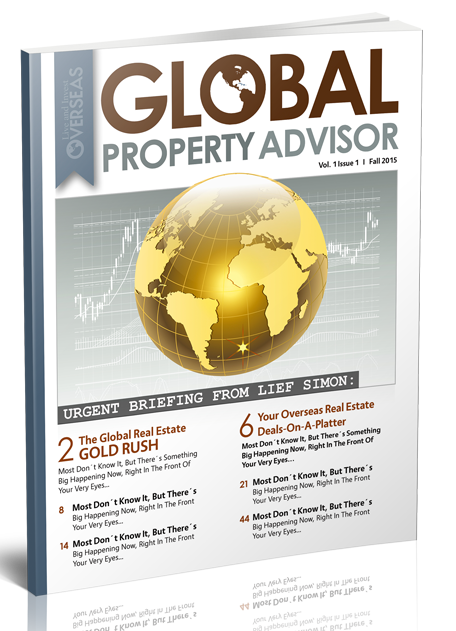 During this time, you’ll get 3 issues of Global Property Advisor plus all of the bonuses described above. Then, if—for any reason—you feel like Global Property Advisor is not for you, simply let me know before the 90-day deadline and, I’ll refund 100% of your money. No questions asked.